Be the first to share your favorite memory, photo or story of Margaret "Jean". This memorial page is dedicated for family, friends and future generations to celebrate the life of their loved one. Margaret “Jean” Graham Mullins, 84 years of age of Raysal WV, passed away Friday, March 1, 2019 in Bristol, TN with her family by her side. Born August 16, 1934, in Oceana, WV, she was the daughter of the late Lace and Lois Cook Graham. Jean attended the Church of God and enjoyed gardening and spending time with her family. Loving mother, sister, grandmother, and great-grandmother. In addition to her parents, she was preceded in death by her husband of 62 years, Mack Mullins; one son, Rufus Mullins; one daughter, Sandra Jean Mullins; two granddaughters, Misty Mullins and Chantel Webb; one sister Betty Mullins; one brother, George Graham; and three brothers-in-law, Willard Farmer, Harold Evans and Raymond Mullins. Those left to cherish her memories include her sons, Darrell Mullins of Bluefield, WV, Sammy Mullins of Grundy, VA, and Billy Joe Mullins of Raysal WV; one daughter, Jackie “Sissy” (Randy) Hamilton of Bristol, TN; three sisters, Patricia Farmer of Marion, VA, Mary Lou Turner of Richlands, VA, and Shirley (Lonnie) Rife of Whitewood, VA; and two brothers, Walter “ Little Bub” (Dedria) Graham of Abbs Valley, VA, and Roger Graham of Richlands, VA.
She is also survived by several grandchildren, great-grandchildren and a special sister-in-law, Frankie Cook. Jean had three best friends that she loved dearly, Myrtle Rife, Brenda Lester and Everette Woody. 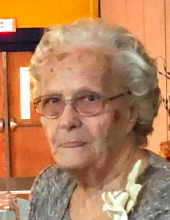 Funeral service for Margaret “Jean” Graham Mullins will be held at the Old County Church of Raysal, WV, Monday, March 4, 2019 at 12:00 noon with Reverend Martin West and Reverend John Willard officiating. Burial will follow in the Tom Sparks Cemetery in Paynesville, WV. The family will receive friends at the Old Country Church, Sunday, March 3rd after 6:00 p.m. with evening service to be held at 7:00 p.m. The family of Margaret “Jean” Graham Mullins have entrusted the care of their loved one to Shortridge-Ramey Funeral Home of Grundy, VA.
Evening Services will be held at 7:00 p.m.
"Email Address" would like to share the life celebration of Margaret "Jean" Graham Mullins. Click on the "link" to go to share a favorite memory or leave a condolence message for the family.